Initially I thought of recreating my first junior high Home Ec make – an apron. 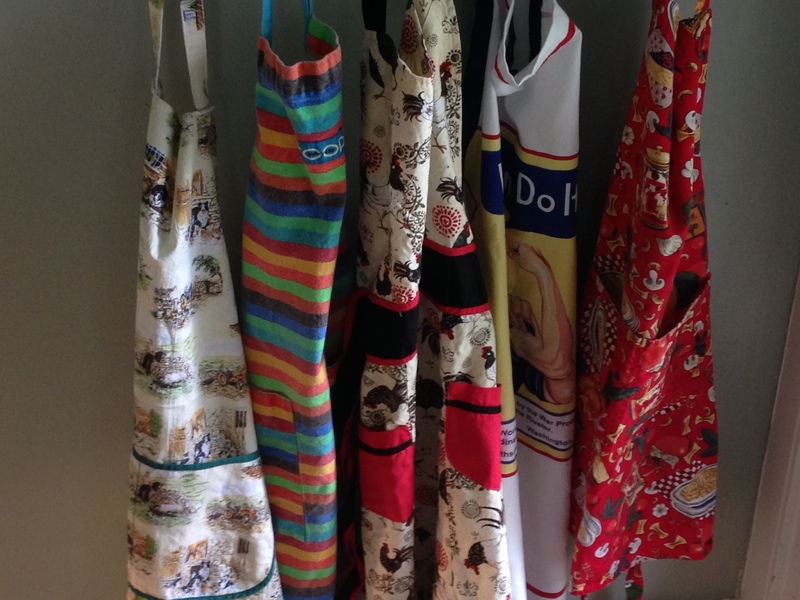 I love aprons, and already have the perfect apron fabric, a black and white toile that was tucked away in a closet for ages. Then I thought about it further and it occurred to me that I might not need another apron. Also, the fabric on hand is clearly marked “dry cleaning recommended”. Wait a minute. For an apron? Not acceptable. Obviously I need a Plan B. Curtains? Throw pillow? No and no. Ah ha! 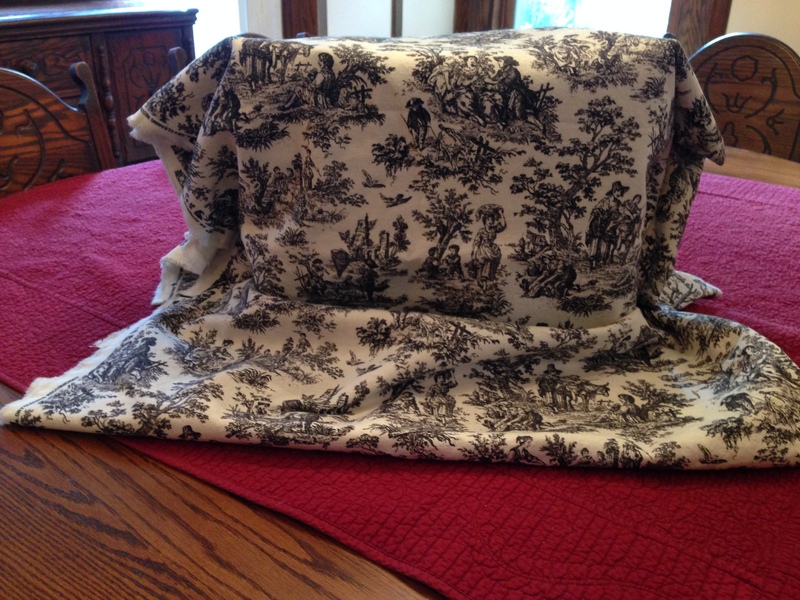 The perfect solution: a sewing machine cover. After all, there is no dripping sauce or flying flour to consider. Yes, Plan B is a keeper. Please stay tuned for evidence of the finished product. TO COVER MACHINE Jennifer Miller image. All rights reserved. And now I have a question for you. What identification do you prefer? Sewer? Sewist? Seamstress? Maker? Personally, after working 25 years for water and wastewater treatment engineers, the word “sewer” has a very specific meaning for me, and it has nothing to do with needle and thread. I rather like “maker“. It’s so artsy and inclusive. Thank you for stopping by! I hope you’ll come back to follow the progress. This entry was posted in Uncategorized and tagged home ec, maker, seamstress, sewer, Welsh wool by jendavismiller. Bookmark the permalink. Sounds promising, and fun. I love that you will be doing a coat in Welsh wool. I personally came back to sewing after a long break and have found coats no worse than a cushion cover… I use seamstress, or even dressmaker – old fashioned but I am British…I have four or five aprons – but all of them are stained with food juices or printing inks (my other hobby) so it would be nice to have a presentable one. But yours look like a shop display. I’m looking forward to seeing what lovely things you design and create! Thank you Leslie. Hopefully I’ll be posting some worthy creations very soon. First blouse pattern awaits fabric selection. But after the sewing machine cover, of course. One thing at a time…..
I’m so glad to have found your blog through the comment you left on howtobechic.com. My dream is to have a small, handmade couture wardrobe, and I’ve also had on my sewing list to make a cover for my overlocker for so many years now it’s not funny. I’ve never thought what to call someone who sews. I think I’ve always said sewer, but seeing it written down is not appealing as you point out! Best wishes to you, Jennifer, with your blog and your sewing. Thank you, Fiona, for a sweet reply. A small wardrobe does seem especially nice for those of us (me) with teeny-tiny closets. I’d love to see the cover you come up with, it will be most elegant. And leave it to me to ruin a perfectly good word for people who sew! Such a funny conundrum. Hello, and thanks for stopping by. Sewing aficionado! I love it, that may just be the perfect solution, fits so many of us. Love your site name, will check it out. Who doesn’t love gorgeous things?